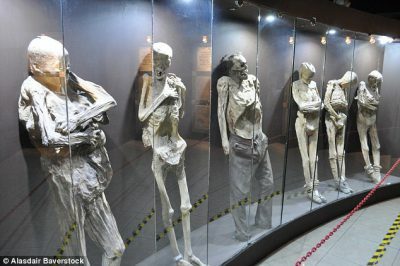 If you ever happen to visit central Mexico, don’t forget to plan an outing to the small mining town of Guanajuato, home to one of Mexico’s most popular tourist attractions – a museum that displays the mummified corpses of over 100 of its deceased former citizens. Many of the mummies on display died in an 1833 cholera epidemic but also include murder victims, a Spanish Inquisition victim in an iron maiden, criminals buried alive, and infants laid to rest dressed up as saints (a Mexican superstition that they believe will facilitate the child’s passage into heaven). The Guanajuato Mummy Museum, which is owned by the state government, sees more than 4000 visitors a week. Tourists pay 55 pesos to gawk at row upon row of desiccated human cadavers, all of which have been disinterred from graves in the cemetery next door. It may not sound terribly appealing, but it’s obviously a winning concept – the museum was recently voted one of Mexico’s best tourist attractions by users of one of Mexico’s most popular tourism websites. Of course, generally when you think of mummies, you think of Egypt… so how did a small town in Mexico get its own collection of mummies? Starting in 1865 and lasting all the way until 1958, Guanajuato imposed a “grave tax.” If their relatives failed to pay the tax for three years in a row, the dear departed loved ones were promptly dug up and evicted. 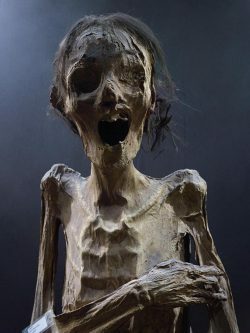 They soon found that, due to the burial procedures and the extremely dry conditions, the corpses often emerged as well preserved (if twisted and shrunken) mummies. The mummies, because they were formed naturally, are much more gruesome looking then your typical Egyptian mummy. Their faces are gaunt and distorted like props from a horror movie, and they’re often still covered in the tattered rags they were buried in. Meanwhile, by the time the grave tax was ended, the cemetery had collected hundreds of mummies which continued to be kept in the local ossuary/museum. Someone at the museum got the bright idea to put the corpses on display, and a money-making machine was born. Behold — the B-Movie Goodness that is Las Momias de Guanajuato! Yes, the mummies of Guanajuato are not only enjoying fame in the afterlife as a tourist attraction, but they’re also movie stars. 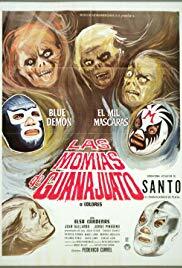 Many of the deceased residents of Guanajuato have appeared in a number of horror films, the most famous of which was Las Momias de Guanajuato (1972) where they costarred with Mexican wrestling superstar/crime fighter/ghost slayer El Santo and his posse of masked wrestlers.